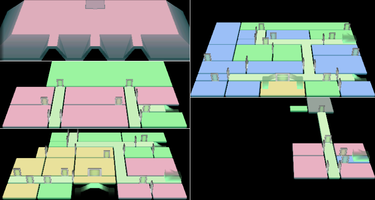 The Artist's Studio (Japanese: アトリエ Atelier) is the final room that must be cleared in the game Luigi's Mansion and this area can be found in Area Four of the mansion. After Luigi unlocks The Artist's Studio, he captures Vincent Van Gore after defeating several waves of ghosts. This allows him to get the golden spade-shaped Key to the Secret Altar from a treasure chest painting. The Artist's Studio contains eight paintings, all lined up in a row along the back wall, except the treasure chest painting, which stands on the east wall. Two two-tiered shelves of art supplies are behind the easels. A small stool is in the southwest corner. In the top left corner of the room is the chimney for the fireplace in the Sealed Room. Sculptures of both Lydia and Biff Atlas are on the shelves. Click an area to open the relevant article. This page was last edited on October 12, 2018, at 22:16.